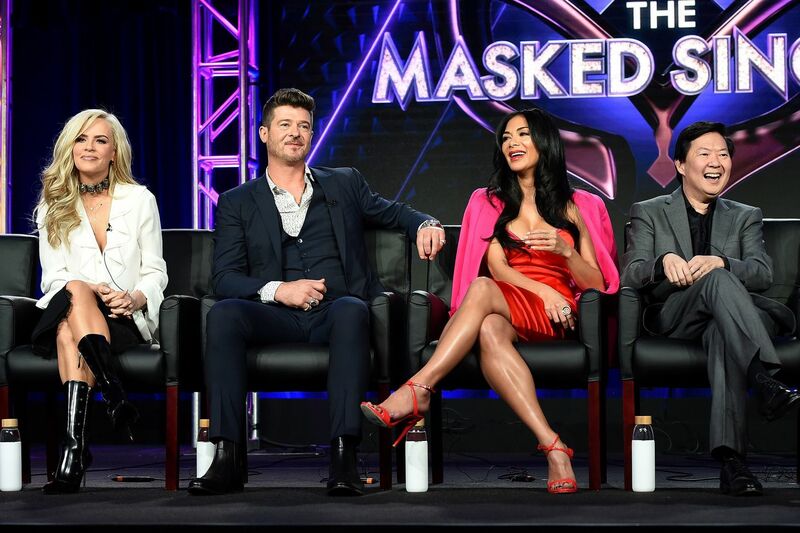 "The Masked Singer" panelists Jenny McCarthy, Robin Thicke, Nicole Scherzinger, and Ken Jeong during a session at the Television Critics Association's winter meetings in Pasadena, Calif., last week. PASADENA, Calif. — Could the Bee possibly be Philly’s own Patti LaBelle? Is the man inside the Peacock Neil Patrick Harris? Your guesses about the identities of any of the remaining contestants on Fox’s The Masked Singer are as good (or probably better) than mine. It wasn’t only celebrities who were shrouded on the set, and coming and going from the studio. “A lot of the celebrities had their managers or publicists also be covered because they were recognizable,” panelist Jenny McCarthy said. Ricki Lake, the unmasked Raven, in the Feb. 6 episode of Fox's "The Masked Singer." Even most senior Fox executives didn’t know the identities of the masked singers. They “didn’t want to know because they were terrified that they would give it away at a dinner party or something,” said Rob Wade, Fox president of alternative entertainment and specials. The celebrity guessers aren’t resorting to Google between tapings. They were asked not to, and “I really wanted it to be pure, you know. That’s the whole point of the show, is that you want to be honest,” said Robin Thicke. “You have your hair to focus on in between taping,” joked Ken Jeong. The Masked Singer. 9 p.m. Wednesday, Fox.